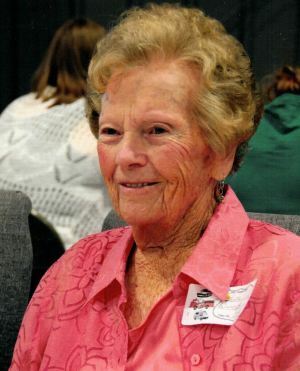 Ruth Helen (Guernsey) Bednarczyk, 96, of Henryville, Indiana, passed away May 28, 2018 at Lake Pointe Village, Scottsburg, Indiana. Born March 5, 1922, in Henryville, Indiana, she was the daughter of Ed M. and Helen D. (Bolly) Guernsey who preceded her in death. She was also preceded in death by 2 brothers, Clifford and Russell Guernsey. On March 7, 1944, she married Michael J. Bednarczyk of Withee, Wisconsin, who preceded her in death. She was a 1940 Henryville High School graduate. She worked at the Indiana Ammunition Plant for over 20 years. Survivors include two sons, Michael E. (Janice) Bednarczyk, Henryville, Indiana, and William R. (Ardice) Bednarczyk, Carmel, Indiana. Five grandchildren, Mark Bednarczyk, Mahomet, Illinois, Jill Morzillo, Louisville, Kentucky, Scott Bednarczyk, Indianapolis, Indiana, Carla Beyer, LaGrange, Kentucky and Christopher Bednarczyk, Boston, Massachusetts, three great-grandchildren, Brendon Morzillo, Sofia Bednarczyk and Kyndall Beyer. Funeral services will be held 2:PM Saturday at the Garr Funeral Home in Sellersburg with burial to follow at Mt. Zion Cemetery in Henryville. Visitation will be Friday from 5-8PM and anytime after 12:Noon until the time of service on Saturday. In lieu of flowers, memorial donations can be made to Mt. Zion Cemetery, 3101 Hebron Church Rd., Henryville, Indiana 47126. Online condolences can be made at www.garrfuneralservices.com.